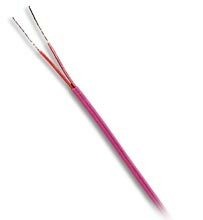 *Maximum temperature is for extension grade wire or insulation, whichever is lower. Weight of spool and wire, rounded up to next highest lb. (does not include packing material). PFA-Insulated, Thermocouple Extnsion Grade Wire, Type E, 20 AWG, 100 ft.
Polyvinyl Insulated, Thermocouple Extnsion Grade Wire (Stranded), Type E, 24 AWG, 500 ft.
Polyvinyl Insulated, Thermocouple Extnsion Grade Wire, Type E, 20 AWG, 1000 ft.
FEP Neoflon Insulated, Thermocouple Extnsion Grade Wire, Type E, 16 AWG, 50 ft.